Days after the Titanic sank the body of a baby boy was found and recovered from the North Atlantic. After the child could not be identified he was buried in Nova Scotia with a tombstone reading simply ‘The Unknown Child’. In 2001 researchers at Lakeland University in Ontario were granted permission to exhume the body. By consulting the passenger lists they had narrowed down the possible identity to one of four children: Gosta Paulson, Eino Panula, Eugene Rice and Sidney Goodwin. Initial tests concluded that the body was Eino Panula. However in 2007 this was shown to be not true. More advanced DNA testing was carried out on a tooth from the body and when compared to the DNA of a surviving Goodwin relative it proved an indisputable match. It confirmed that ‘the unknown child’ was Sidney Goodwin. 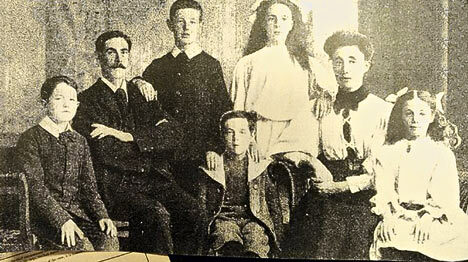 Sidney was the youngest of six children born to Fred and Augusta Goodwin from Fulham, England and were immigrating to Niagara Falls New York. (All were onboard) Neither Sidney’s parents nor his siblings’ bodies were ever recovered. You can see a photo of the rest of the family here. Interesting Fact: I should also give credit to another research scientist and radio/TV personality Karl Kruszelnicki (Dr Karl) from Australia. Several years earlier he studied bellybutton lint samples sent to him by almost 5,000 people and found some similar findings and that the typical lint producer was “a slightly overweight, middle-aged male with a hairy abdomen”. The photo above is a 25 year collection of bellybutton lint from another Australian Graham Baker. This gave him a place in the Guinness Book of Records.